It's time for another blast from the past. While drafting a piece on my current feelings for Bungie's Destiny, I was reminded of my old fight with Ninja Gaiden. Sure, my issues with Destiny are a bit different than my long fight with the hideously difficult Ninja Gaiden, but many of the emotions involved are the same. I know Ninja Gaiden 2 is fun. I know it's satisfying to slice demons and rival ninjas apart. I know that if I buy it I'll cackle madly in the night. All that aside, I'm not about to buy another Ninja Gaiden game. Ever. The reasons aren't industry related, nor do they point to a larger issue within our niche. It all goes back to my freshman year of college. I lived in a small dorm room with my friend Conor. Between the two of us, we had every current console. My prized possession was my GameCube, but it was May of 2004 and Ninja Gaiden was due to be released on the Xbox. In a whirlwind tour of tutoring, I scraped together the cash for the game. On buying it, I was given the option to buy the strategy guide. I refused, outraged by the very thought of relying on advice from some book to guide and hone my ninja skills. Ahem, I mean skillz. The disc was torn from the case and roughly inserted into the tray of that humming black box I called friend. I toiled through the night, rarely pausing for anything but the most basic of needs; food, toilet, MacGyver. The first few levels offered a decent challenge and I was pleased with my progression. As the days wore on my abilities grew. I became less than human. Like the black armor-clad tyrant of lore, I was now more machine than man, sans twisted and evil. I scoured every inch of the maps for golden scarabs, and I found every weapon in the game and farmed enemies for hours to level them up to their keenest edge. I beat eight or nine combatant battles in under a minute. I had become a weapon, unleashed upon unwitting ninjas and demonkind with devastating result. Boss fights were difficult, but I rarely died more than three times before claiming my enemy's head/tentacle/eyestalk/carapace. My greatest achievement came when I finally gripped the powerful hilt of the "Unlabored Flawlessness", the cataclysmic final form of the previously useless wooden sword. I was pleased with myself. I was treated with respect by my fellow dorm-dwellers. The kind one shows for a wizened master of the dark arts. I was a god. Victory was close. The enemies were hardier with every screen and the towering spire in the distance loomed closer by the minute. Then everything changed. I was greeted with a new threat in the form of large, ghostly piranhas eager to rend flesh from bone. My weapons had little effect on them, and I knew I couldn't risk using all of my ninpo on these beasts. Working past these dread beings cost me three months of my life and more health and elixir than any other section of the game. I was frustrated but remained stalwart in the face of my enemies. Finally, after battling the cursed fish and various other lesser demons, I came to fight the slaughtered horde's general. Like a coward, he conjured illusory beasts for me to fight. I dispatched them as best I could in my weakened state, and found myself at the feet of that slavering beast, bloodied steel at the ready in only a few days’ time. Beleaguered and enraged, I fought on as he flew, taunting me by staying just out of reach of my most brutal assaults. That was until he fought on my terms. I fought that wretched being for nearly a year. That same battle raged every night until it played in my sleep. The demon invaded my dreams, humiliating even my subconscious self, patiently waiting to strike at me from behind my eyes. Somewhere in that nightmare I cracked and bought the strategy guide, but even it couldn't assist me in the state I entered that fight. 9 times out of 10, I would face the beast with a quarter of life remaining. Still I fought. This must end some time, I thought. Still death came as swiftly as it always had, night after night, day in, day out. This incident came close to swearing me off video games forever. I couldn't look at my console without feeling nauseous. I couldn't bring myself to play anything else but that now epic battle over and over again. Victory was hopeless. I knew nothing but this one fight. Loss came as easily as breathing. Then came the day. I fought the beast in the same arena on the same terms. This time though, I was winning. I was now in a position to reverse my fortune. All my pride and integrity was again in my grasp. I felt good again. I was confident. Conor, on seeing how close I was to delivering the final blow, sat transfixed by the historic moment. The demon reeled from my attacks, bled profusely from every wound I inflicted. His eyes grew desperate. Death called for him and he strained against its dulcimer notes. Now ready for the finishing blow, I readied my blade. I struck, but too late. The beast’s last desperate claw caught my face and sent me hurtling against the rock wall of this bloodied theatre. My body collapsed, dead. Some part of me died at that moment. All the determination I had to defeat this fiend and move on with my game was replaced with spite. I hurled my controller across the room, cursing. I immediately removed the disc from the tray, placed it in its case, and traded it in for store credit. 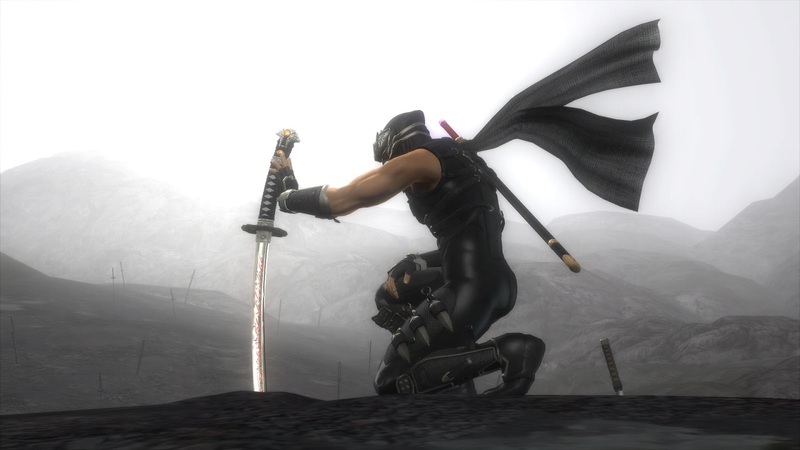 Having been through my own hell with Ninja Gaiden, I believe I've played enough of the action genre to satisfy me forever. I feel no desire to play any such game, be it this latest iteration of the Gaiden series, a Devil who may or may not cry, or any other brand within this genre. I cannot bring myself to grip a controller in thrall to those mechanics ever again.